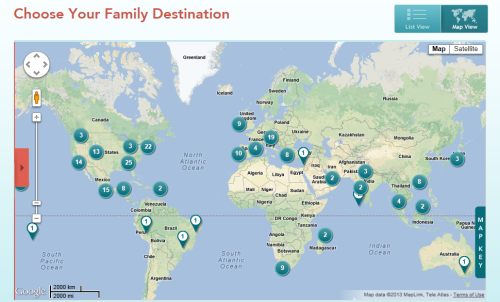 So, you want to find THE BEST hotel or resort for your family’s next vacation. You want to stay somewhere that doesn’t merely tolerate your children, but that embraces your kids with open arms, a welcome kit, kid-friendly dining, reliable childcare, and a fabulous hotel pool. Is that asking too much? Preferred Family doesn’t think so! What’s more, PreferredFamily.com wants to give you a $100 Visa gift card just for checking out their website! Read on to learn more about the giveaway and Preferred Family’s hotels that LOVE kids. PreferredFamily.com makes finding your family’s ideal accommodations easy by vetting the best of the very best in child-friendly amenities and activities. While many hotels and resorts purport to be family-friendly, those listed on Preferred Family take it to another level, offering truly family-centric lodging options. * Settings (beach, mountain, city or lake), style (from stately to relaxed)…and more! The site’s super-handy Three Days In tab provides suggestions for fun family activities, attractions and restaurants plus tips for navigating various destinations. Preferred Family’s Three Days In Los Angeles itinerary has me dreaming of a getaway filled with panning for gold, eating mochi ice cream in Little Tokyo, and hiking to waterfalls. I am a San Diego resident who rarely visits my northern neighbor city, mostly because I can’t figure out what exactly to do with my young children in this expansive metropolis. But now, I long to book a couple of nights at the swanky Montage Beverly Hills for its outdoor playground, child-sized robes, and proximity to the Hot Wheels Hall of Fame for the kids and Rodeo Drive for Mama. Ooh! 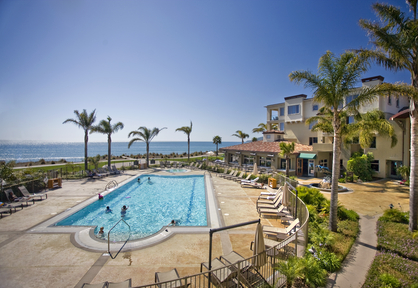 Or, maybe we should stay at the Dolphin Bay Resort in San Luis Obispo with its infinity pool, bicycle rentals and oceanfront location. There’s so many decadent options, it’s hard to choose but fun to dream! Preferred Family also offers a round-up of links to popular family travel blogs (like Travel Mamas!) so you can find a plethora of advice from those in the know, all in one spot. These stories and tips makes planning your next vacation that much easier to do. Think Preferred Family is out of your price range? Well, then you’ll want to check out their Special Offers section to take advantage of discount packages. From free breakfast to golf packages and other discounts, these offers will tempt any armchair traveler. If you’re like me (and I think you are! ), you want everyone in the family to get a good night’s sleep while away from home. A vacation is no fun if the kids and parents are cranky from lack of sleep due to cramped sleeping quarters. That’s why I recommend booking a suite whenever possible. The extra room means better sleep for all, as well as privacy for parents after the kids go to bed. You can easily find which of these family accommodations offer suites by checking out the Preferred Suites section. Your family deserves a little break from reality with no to-do lists, deadlines, or homework allowed. Vacations are a time to truly indulge in well-deserved luxuries like a spa treatment, family time at the pool, and delicious dining prepared by someone else. This brand caters to families in need of some rest and relaxation, so you can focus on creating memories that will last a lifetime. Now it’s your turn to check out Preferred Family. If you do, you could win $100 Visa gift card. All you have to do is like Preferred Family on Facebook and visit www.PreferredFamily.com before leaving a comment below about at which Preferred Family hotel or resort you’d most like to stay. Tweet about the giveaway daily for bonus entries. Use the Rafflecopter form below to make your entries. Enter by Tuesday, February 18 by 9 pm PST. Winner will be notified by email and must claim prize within 48 hours of notification. Giveaway is open to U.S. residents 18 years or older only. See additional contest rules in the Rafflecopter form. Travel Mamas contributors and their immediate family members are not eligible to win. A Note from The Travel Mama: Thank you to Preferred Family for sponsoring this post. All opinions shared in this story are my own. I would like to visit the Hawks Cay Resort in Florida. I would choose the Hermitage Hotel in Nashville. I’d like to take my family to the Jefferson in Washington, DC. I’ve been to Santa Fe and stayed at the Eldorado Hotel…I’d love to go back!! The Blackwell, in Columbus OH. The Sandpearl Resort in Florida. Las Terrazas Resort in Belize looks lovely to me! I would love to visit the SandPearl Resort in Clearwater Florida with my family. I would love to go to the Teton Mountain Lodge & Spa in Wyoming. I would love to visit the Dolphin Bay Resort & Spa in Obispo, CA. I really want to go to the bahamas so I would have to say Atlantis. Brasada Ranch is Oregon sounds like a great place to relax with the family! The Villas of Grand Cypress, as my son wants to go to Orlando, Florida. The Boston Harbor Hotel looks amazing! We want to check out the Hermitage Hotel in Nashville! I’d love to visit the Topnotch Resort and Spa in Vermont!